The curved-belt manual treadmill is a newer subcategory. They rival the best motorized treadmills in sturdy design as well as in having a high price tag. They have become the darling of athletic trainers and you may see them at your local gym. Compare these categories and see which type of treadmill would work best for your needs. On a manual treadmill, the action of your feet against the deck moves the belt. The belt only moves if you move it. Both runners and walkers expend more effort on a curved belt non-motorized treadmill than on a motorized treadmill. This has fitness benefits as users can get their heart rates into a higher zone at a lower speed. One study found that subjects expended 30 percent more energy at the same speed. But the trade-off was that they preferred to run or walk at a slower speed so as to keep their exertion constant. Another study compared the curved belt treadmill to a motorized treadmill and overground running. The runners had much higher heart rates at the same speed when on the curved belt treadmill—more than 20 beats per minute higher on average. The runners who were lighter in weight had to work harder to overcome the treadmill belt resistance. Runners will find most flat-belt manual treadmills to be unsuitable due to their less-rugged construction and should only consider curved-belt models. Walkers may be satisfied with a flat-belt or curved-belt model and be able to get a more intense workout at a lower speed. Muscle-powered: You provide all of the motive power and exercise your lower body. It is likely that you will expend more calories per mile. You control the speed by putting in more effort rather than trying to keep up with a moving belt. On a curved-belt treadmill, you speed up by placing your feet further forward and slow down by striking closer to the center of the belt. Safety: A non-motorized treadmill stops when you stop; you don't have to wear a safety cord to stop it if you slip and fall as you should with a motorized treadmill. This also makes it a little safer around children and pets. Flat-belt manual treadmills are less expensive: Most flat-belt manual treadmills sell for under $300. However, the preferred curved-belt treadmills cost at least $3,000. 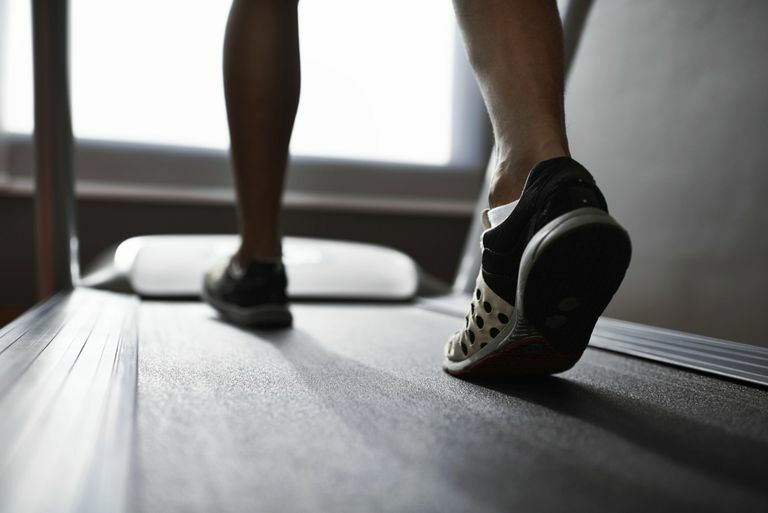 High-intensity interval workouts: Athletic trainers use curved-belt manual treadmills as part of workouts that alternate high and moderate intensity. Many professional sports teams use these models for training, doing sprint intervals on the curved-belt treadmill. Joint stress: It can be difficult to get the treadmill belt moving initially, especially with flat-belt models. Straining against the belt can stress your joints. If you have knee or hip arthritis, this may be an issue. You may have to raise the incline of a flat-belt manual treadmill significantly to make it easy enough to get the belt moving. Once you do that, you are walking uphill and that may not be what you prefer for your workout. Can only set incline by getting off a flat-belt manual treadmill: Once the belt is moving, you would have to stop and get off to change the incline. You are stuck with one incline level during each workout and often that is quite a steep incline of 10 percent. Many users say they must hold onto the handles due to the incline, which ruins good walking and running form and likely reduces calorie burn. A curved-belt manual treadmill does not have this drawback as you can vary the incline by moving your feet farther forward or more towards the middle of the belt. Lack of features: You won't have built-in workouts, apps, and other features. You'll have to use other resources such as apps and online treadmill workout plans to vary your workout. Most have a simple battery-powered display that can show workout details such as elapsed time, distance, calories burned, speed, and a pulse sensor. Less sturdy: Flat-belt manual treadmills, in general, have less sturdy construction, as you can see from the user weight limits. They also seem to have more flaws such as belt slippage and noise. Check the user weight limit for any model as a way of determining how sturdy it may be. Curved-belt manual treadmills feature more robust construction and higher quality. Walk, don't run: Because of the less sturdy construction, flat-belt manual treadmills are best suited for walking rather than running. They also often have shorter belts, so you can't use a long running stride. If you want to use a treadmill for running, choose a curved-belt manual treadmill or a better-quality motorized treadmill. Exerpeutic 100XL Manual Treadmill: It has a 325-pound weight capacity and a three-year warranty. Fitness Reality TR3000 Maximum Weight Capacity Manual Treadmill: It has a 325-pound weight capacity and a limited 3-year warranty. Woodway Curve: This machine has found a place in the training rooms of major sports teams and that attests to its quality. It is also the treadmill used in research studies. It also makes the list of top treadmills overall by Runner's World. Speedfit Speedboard: This brand has both a Lite and a ProXL model. TrueForm Runner: This machine is available with a running track surface, rubberized belt, and even a turf surface for football or soccer players. HiTrainer: This company has three models for audiences including fitness, sports conditioning, and rehabilitation. With a motorized treadmill, a motor sets the belt in motion and you have its assistance when you walk or run. The horsepower of the motor is one of the big factors the quality of the machine. You should look for at least 1.5 continuous horsepower (CHP). You need a bigger motor for heavier users and for higher speeds. No straining: The belt is moved by the motor, you don't have to strain to start it. Speed and incline adjustment during workout: You can adjust the speed and incline while you are still walking or running on most motorized treadmills. Some models also have a decline feature so you can go downhill, better simulating overground walking and running. More workout features: Motorized treadmills are packing more and more workout features into their consoles, even at the lower price points. They often will work with apps to provide fun and interesting workouts, and programs to train you for performance at different distances such as 5K, 10K, half marathon, and marathon. Suitable for longer training sessions: You can put in long endurance sessions on a motorized treadmill, while manual treadmills are generally used for shorter workouts. Running and walking: You are able to find models with motor power and treadmill belt length to accommodate runners as well walkers. As the motor adds weight, these machines are more stable than flat-belt non-motorized treadmills. Electricity needed: You need to locate it near an electrical outlet, and it may even require a higher voltage if it is a commercial treadmill. Safety: A motorized treadmill can be a safety hazard. It's easier to fall on one if you are distracted or stumble and then get propelled off the back. You need to wear a safety cord to shut it off in case of a fall. Cost: Motorized treadmills for home use start at a higher price point than flat-belt manual treadmills. You should expect to pay at least $1,000 for a machine of acceptable quality. Models in lower price ranges usually have underpowered motors, are less sturdy, and have fewer options. You will find many sites that rate treadmills, both those that use expert opinions and those that aggregate user reviews. You will need to read these critically. User reviews are plentiful for models at the budget end of the market, but it's hard to find an acceptable-quality motorized treadmill for under $1,000. The treadmill repair site TreadmillDoctor.com gives a good review of brand quality and history so you can see how well they hold up to use. Brand names that have the best reputation for quality include NordicTrack, True, Vision, Sole, and Precor. NordicTrack Commercial 1750: This treadmill has the features to please most users, including a 7-inch touchscreen, iFit workouts, and both incline and decline. It has a long and wide belt. The 3.8 CHP motor can serve users who weigh up to 300 pounds. Proform Pro 2000: This treadmill has a 3.5 CHP motor and has both incline and decline features. It is compatible with iFit for workouts that simulate a variety of terrain. It comes with a great warranty. Bowflex BXT116: This is a solid machine with a 3.75 CHP motor and incline up to 15 percent. You will find the best deals on new treadmills in January as retailers capitalize on fitness resolutions. This is also when you will see the best selection. By June, you may begin to see close-out sales on models that remain in stock. Be aware that most treadmills sell year-round for far under their manufacturer's suggested retail price, so you should always shop for deals. It can pay to spend time talking to a dealer about how you plan to use the treadmill—walking, running, multiple users, and types of workouts. They can help you decide what features you need. You will get the most machine for your money by buying a better-quality used treadmill. Many people sell lightly-used treadmills after their resolutions wear off or when they need to move. Look for great deals from private sellers in the summer. You may also be able to purchase commercial grade used treadmills from gyms that are updating their machines. Check the reviews of models you are interested in and see how they have held up for purchasers. Ask the seller how long they have had the treadmill, how often it has been used, and whether they have performed regular treadmill maintenance. A big factor to consider is delivery and setup of the treadmill. For new treadmills, this may be included or available at an extra charge. As these machines can weigh over 100 pounds and are bulky, it can be a struggle to get them upstairs. If you are buying a used machine, you may have to arrange this for yourself. Shipping costs can also be very high if they are not included in the purchase price. A treadmill can give you a great cardio workout, but you need to ensure you are getting the right machine for your needs. Try different treadmills in the gym so you become familiar with the features you prefer. You may even decide the best tactic is to use the treadmill at a health club, school, or gym rather than purchasing one for your home. You might be able to switch back and forth between a curved non-motorized treadmill and a good quality motorized treadmill to get a variety of workouts. Edwards RB, Tofari PJ, Cormack SJ, Whyte DG. Non-motorized Treadmill Running Is Associated with Higher Cardiometabolic Demands Compared with Overground and Motorized Treadmill Running. Frontiers in Physiology. 2017;8. doi:10.3389/fphys.2017.00914. Smoliga JM, Hegedus EJ, Ford KR. Increased Physiologic Intensity During Walking and Running on a Non-Motorized, Curved Treadmill. Physical Therapy in Sport. 2015;16(3):262-267. doi:10.1016/j.ptsp.2014.09.001.